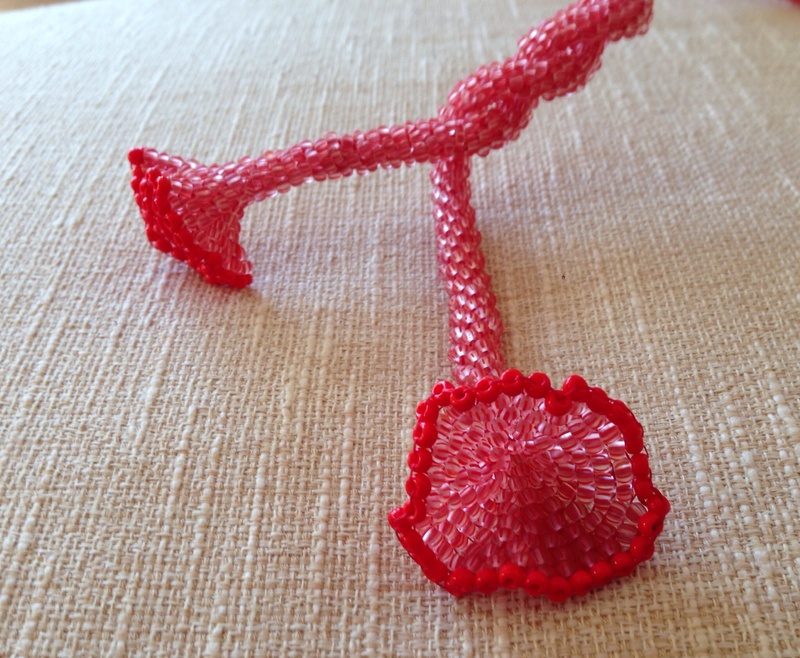 For several years I have been eying up the photos on Jean Power’s website of her ‘faux bead crochet’ bangles. Now I love the appearance of bead crochet, but I’ve had several goes at doing it which have always ended in tangles, uneven work and tears. I’m sure it’s lovely and quick once you are expert, but for me it is incredibly slow, and combined with the absolute tedium of threading all the beads on before you even start I feel it’s not for me. However it does make the most beautiful beaded ropes, so a fake version using beadweaving techniques I’m familiar with seemed worth a try. Staring at Jean’s photos repeatedly over many years sadly did not reveal her secret, and though Jean has been teaching it as a workshop I’ve never been able to go. So when her recent newsletter announced she’d released a tutorial I grabbed one straight away (the joys of instant downloads). Reading through revealed I had been a numpty, as her solution is elegantly simple, but there is much in the tutorial that I would never have worked out even after years of playing, particularly the joins, so it was well worth the money to skip the experimentation and go straight to a very refined solution. All I need now Jean is to work out how to split the rope into two or three so I can do branches please? Anyway I’ve made so many bangles lately that I thought I would instead make something more like a lariat, but I ran out of beads (poor planning) so I’ve made a short rope with increases at either end to form frilly cones (a la CGB 1 although using Jean’s stitch with increases, not their technique as it didn’t really work for me). I then threaded a wire through the middle so the piece can be sculpted into a choker, bracelet, whatever. The simplicity of the design and technique made it a very relaxing, stress busting kind of piece to make, so I think I will be using this technique again soon. Read the instructions all the way through. Jean explains the theory as well as giving step by step instructions so you will be better equipped to improvise and add your own touches, as well as to complete the projects she details. If you are not used to the basic stitch Jean uses, do a flat square sample first so you can get your technique (particularly tension) sorted. Use big beads. There are some extremely beautiful bead crochet works out there using teeny weeny beads, and this technique will undoubtedly work extremely well for those, but you need to practise first. I would definitely heed Jean’s advice and start with 8s. 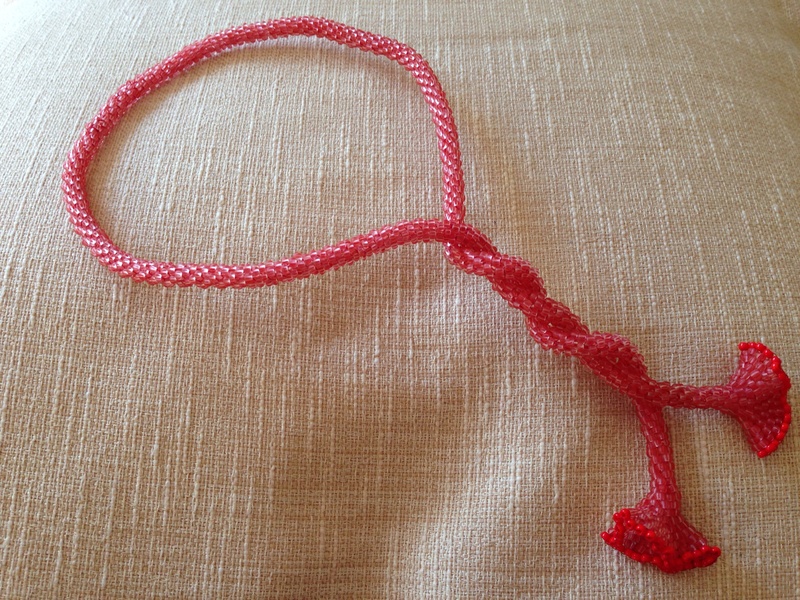 Make sure you have enough beads as this lovely speedy technique will munch them up quite quickly – 20g made a 5 around rope (probably the thinnest you can do with size 8s) 70com long. So I’d reckon at just under 30g for a 1m rope which would make a versatile long necklace or lariat, and you should get a bangle out of the standard 6g tube of 8s. You can always do a sample of say 10cm and then weigh it to estimate. The slightly more organic appearance of crochet or faux crochet with 8s means this is a really good way to use up those beautiful but sadly wonky and uneven seed beads you bought all those years ago before you discovered the easy uniformity of Japanese beads. And you can also use the beads you bought for kumihimo but couldn’t use because the holes were too small for the bigger working thread (although you can use thicker threads for this technique and make a feature of them if you want, just like bead crochet). In theory you can use this technique for any bead crochet type piece – there are some amazing patterned ropes out there and I can’t wait to try. Have a look at my Faux Cro Pinterest board for some ideas if you’re interested. I’d also like to try working round a core of cord or tubing so that I can tie on and bead over some feature beads, and I will have to find some quiet time and work out how to split the rope so I can do branching designs. Author theindecisivebeaderPosted on October 7, 2014 October 9, 2014 Format ImageCategories BeadworkTags bead crochet, beadweaving, beadwork, faux bead crochet, jean power, tutorial1 Comment on Faux cro rocks!